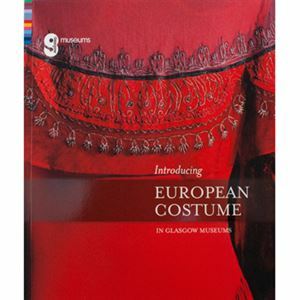 Introducing European Costume in Glasgow Museums gives the first overview of the historic European Costume collection in Glasgow Museums. It offers a snapshot of the star pieces after over 100 years of collecting. Some may be familiar to regular visitors to our venues, such as Kelvingrove Art Gallery and Museum and Riverside Museum. Others are being introduced for the first time. Introducing European Costume in Glasgow Museums spans items of early seventeenth-century dress, which are currently on display in the Burrell Collection through to items from the twentieth century on view at Riverside Museum. Introducing European Costume in Glasgow Museums was produced to commemorate the exhibition A Century of Style: Costume and Colour 1800-1899, on display at Kelvingrove Art Gallery and Museum from September 24 2015 - February 14 2016. The author Rebecca Quinton is Curator, European Costume and Textiles at Glasgow Museums and Honorary Senior Research Fellow, History of Art, University of Glasgow. In recent years she has written a variety or books examining the city's extensive European Costume and Textiles collections. Titles published so far include Glasgow Museums: Seventeenth Century Costume, the first in a series of books looking at the collection by century.